A computing show like CeBIT will never be a staging ground for the launch of massively exciting consumer products. 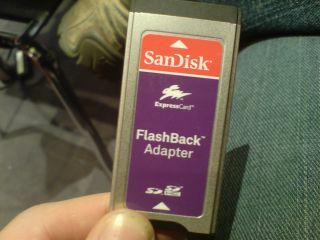 But it is a place where many low-key innovations first emerge, and the SanDisk Flashback adapter is certainly one of those. The Flashback adapter fits into the ExpressCard slot on a laptop, and automatically backs up your important files onto a removable SD card. The idea is that if your laptop experiences an epic failure on the scale of a total hard disk crash, you won’t lose any of your most important files. What’s more, it also protects your data if you happen to lose your entire laptop. All backed-up files are encrypted, and there’s also an option to additionally back-up all your files onto an online server. So your data can always be retrieved, no matter what happens. We met up with SanDisk in Hall 26 at CeBIT for a hands-on test of the Flashback, to see if it works as well as SanDisk says it does. As you can see from the picture, it’s a fairly basic product – it’s small and light – which is reflected in its modest price of around £20. For the money, you get the physical product and also some software which needs to be installed onto your PC. It’s a fairly basic app, which will please some people but will also irritate others. In a small on-screen window, it uses four tabs to take you through the setup process. Here you select which folders and files you want backed up – so no unimportant files will be stored on the SD card (which you will need to buy separately). One of the tabs presents you with the online back-up options, but unfortunately this part isn't very customisable. It’s either on or it’s off. There’s no way to tell it when to sync with the online server. And that means if you created a 10GB file in one of your selected folders, the file would immediately begin to upload to the server. There is no way of telling the app to wait until night-time to perform the back-ups, which could present you with some bandwidth problems if you’re on a slow or busy connection. There also didn’t appear to be any way to limit the bandwidth that the application uses, which again might irritate some end-users. But the beauty of this product is in its simplicity. Most people will be able to set it up once, and then never have to touch it again. It’ll happily back-up your files on flash memory, in real time. And from that moment onwards your data is happily stored, safe and sound. All in all a great little product then. The price is right, it’s easy to use and it finally gives laptop users an excuse to use that normally vacant ExpressCard slot.